CorpPass is the Singapore’s corporate digital identity for all the businesses functioning in the market whether it is a profit or non-profit organisation. It serves to transact the companies with the Official Government agencies online. CorpPass is managed entirely by the Government Technology agency, and it is working quite effectively for quite some years. If any corporate needs a digital identity then they have to register their company on the CorpPass website, the process I will describe below in the content. CorpPass has proved to become a whole lot convenient platform for the business companies. The business companies don’t have to conduct multiple transactions from different sources to transact with Government departments. With CorpPass the businessmen will get ultimate control of their business financial processes, whether they want to make tax payments, employees’ wages or they have to control their employees’ access to the Govt. digital services. The CorpPass has the level of top-security, reliability and effectiveness in paying procedures for the companies registered with them. Undoubtedly one of the best institutions from the Government of Singapore for the aspiring businessmen. You can quickly get help from the top-notch Accounting services Singapore to help you get registered on CorpPass and as well as while conducting any transaction for employees or CorpPass. Get help from the financial experts and understand how to process the whole authorization task. To setup your company at CorpPass and start getting its perks you have to follow some registration procedure. Registered Officer from the particular entity will be required to appoint an Administrator at CorpPass. Just to be sure the maximum number of two administrators will be allowed for each entity. 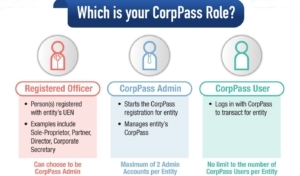 The CorpPass Administrator that is appointed begins by simply registering for the specific CorpPass Administrator account that is developed on the Govt.’s CorpPass official Website. The Business Company’s Registered Officer will then approve the registration process. Once the registration is accepted, the CorpPass Administrator can easily create the CorpPass accounts and also manage its users’ access to all the digital services from CorpPass. To successfully and efficiently transact the entity has to manage the account on the platform with an ID and password that you get in the registering process. All such hurdle can be saved for you, as the experienced Secretarial services Singapore can assist you with all such registering process while you focus on your business alone. To get the third party authorised on behalf of your Business Company, you have to follow the simple steps listed below. The client from the particular company has to login with the UEN ID, the CorpPass ID and the registered password. Then you have to arrive at the 2FA verification page select option A (via SMS), enter the mobile OTP (One Time Password) and get the verification done. After that, arrive back at the home page and click the Third-party section. After giving your information enter the entity info (such as our entity name: JM Management & Accounting Pte. Ltd./ EUN/Entity ID: 201204664D), fill up all the additional details. The will ask to select the third party authorisation you would like to do from the list provided of multiple entitles in your account’s list. If the third party that you want to get authorised is not in that list, you have got to set up and assign digital services section at home page. Select the entity you want to get authorised and then click on the further details section, fill it all up and finally click submit. Boom! Congratulations, you have completed the authorisation process of the third party to act on behalf of your company. Hire the professional accounting services as well as to not face any hurdle while registering and paying for GST and other multiple purposes.